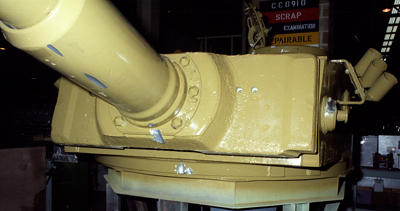 In Part VII of the story of Tiger 131’s restoration, the Tiger reveals its battle damage. One thing we particularly asked ABRO to do during the restoration was to highlight the battle damage on Tiger 131. 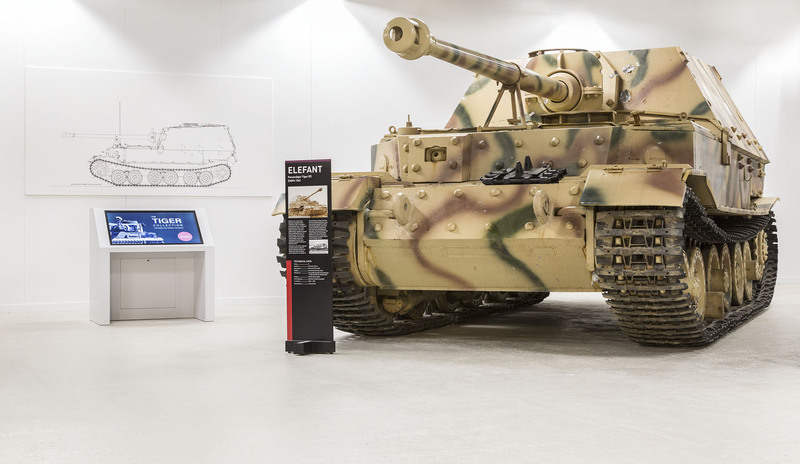 After all it is very much part of the tank’s story and it gives rise to some interesting questions, only partially resolved by the current restoration. To begin with how serious was the damage inflicted by the British and why did it cause the crew to abandon their tank? Secondly, is there evidence to show that restoration of Tiger 131 actually began in 1943? The damage to the gun and turret ring. The damage appears to have been ignored when reports on the captured tank were compiled and, since no information has ever been traced of the crew we do not know their side of the story. Thus the best we can do is speculate, using original photographs and the information now available to us as a result of the strip down and reconstruction. This could provide some interesting material to study over the next two or three months. More damage to the turret. 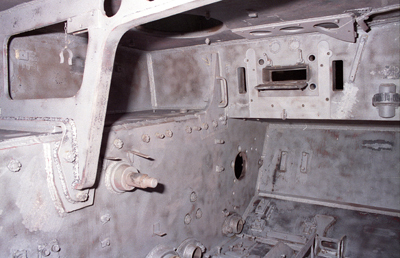 This photo, taken during the restoration process, reveals damage just above and to the right of the driver. The armour here is only about 26mm thick, could it have been penetrated sufficiently to incapacitate the driver – is that why the tank did not move? Notice the frame with the three circles is bent. Look here, just under the axe handle; there is a weld seam running fore and aft but it also looks as if a D shaped patch has been welded in. Is this also part of the battle damage and does that mean that it was repaired by the British, after it was captured? Or, is there another explanation? This damage to the mantlet trunnions is quite distinctive and still visible, but how significant is it? You could still elevate and depress the gun, so it may not have been that bad, but once again it was not until ABRO began the restoration process that the extent of the damage was revealed. 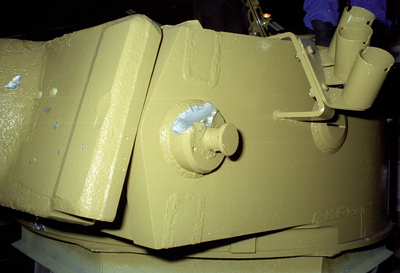 The distinctive damage to the mantlet trunnion. 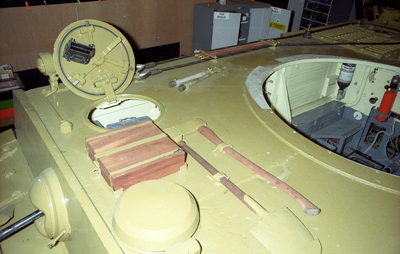 The large cylinder in this picture is described in the British report on Tiger 131 as the Gun Balance Spring Casing. In effect it is a counter-balance to offset the weight of the gun, it contains a large compression spring and is adjustable. 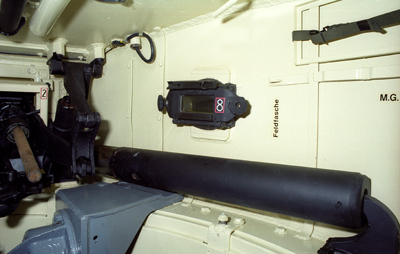 It is located on the right side of the turret, just above turret ring level and attached to the mantlet by the complicated bracket at the front, next to the number ‘2’. It was found to be damaged during restoration and may well have affected operation of the gun at the time of the action. It also serves to show the punishment tanks take under impact. That a round striking the left trunnion can damage a unit such as this on the opposite side of the turret argues a fairly hefty blow. This is another example of damage that was probably repaired before the tank left Tunisia. The loader’s hatch clearly took a bashing and one assumes that it was open at the time. Was this after the loader escaped or did the crew leave it open in action to ventilate the turret? 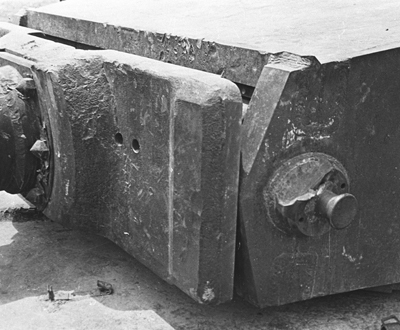 The original, damaged loader’s hatch in Tunisia. 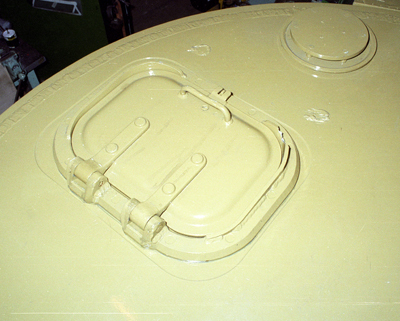 This, then, must be the loader’s hatch from another of the Tigers in Tunisia. It would appear to have been in place by June when the King and Winston Churchill saw 131 in Tunis. 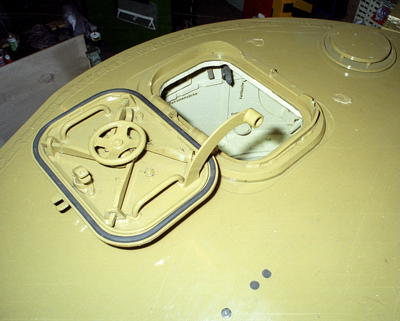 One other spot of battle damage that everyone seems to notice is in the centre of the turret stowage bin, shown in the image at the top of this article. It looks like shrapnel damage and there is no telling when it was done but, whatever caused it, the pattern of holes is quite distinctive. 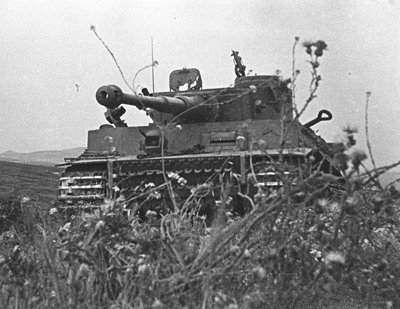 In terms of what actually happened to Tiger 131 it is hardly significant. Whatever may have been stowed inside the bin (the official stowage list says 10 spare track links and 10 spare track pins) may have been damaged but not destroyed. Minor, or incidental damage, either from accident or battle is inevitable, especially on rough terrain. 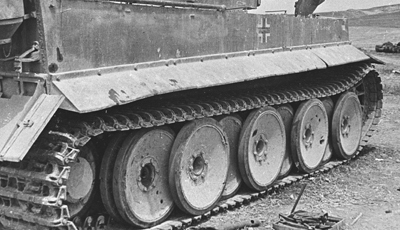 This photo of Tiger 131, taken in Tunisia, shows evidence of battle damage to at least two of the outer road wheels. 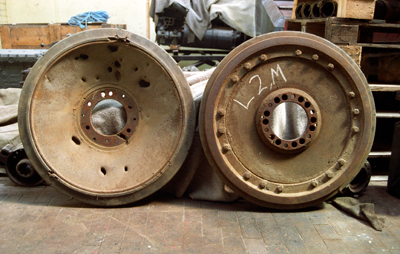 The damaged second and third outer wheels. 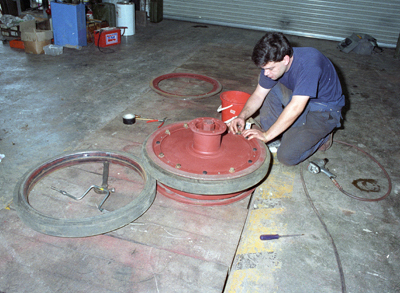 It is even more evident in this view, taken during the early stages of restoration; notice additional damage to the rim and hub. This photo also gives us a chance to see both sides of a roadwheel at once. The outside and inside of the roadwheels. Restoration work on the roadwheels involved removing tyres to clean the rust from inside the rims. Non-structural damage was not repaired. In the next post we’ll look at a few more details.